North Jakarta and Seribu Islands Fire and Rescue Sub-dept., held fire handling simulation at one of the 2018 Asian Games venues, Mahaka Square Jalan Raya Kelapa Nias, Kelapa Gading Barat Urban Village, Kelapa Gading, Wednesday (8/15).
" 35 people are participated in the simulation, consisting of engineering officers and security officers"
According to Satriadi Gunawan, Head of North Jakarta and Seribu Islands Sub-dept., the Mahaka Square ill be used as an eSport exhibition sports venue. Hence, the readiness of officers at the site to face fire disasters is very important. "35 people are participated in the simulation, consisting of engineering officers and security officers," he expressed, Wednesday (8/15). 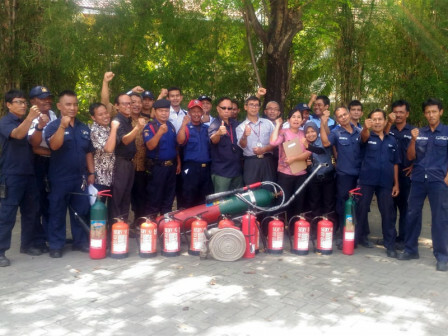 The participants are given various skills in dealing with potential fire disasters such as how to put out the flames from gas stove and how to use portable fire extinguishers (APAR). "It's aimed to make them more skilled in handling fires, considering this place is one of the venues," he said.